Gale Force 9 is now taking pre-orders for their new board game based on the Spartacus TV series. If you didn't get your ninja shopper at GenCon to pick you up one, now's your chance to get your name on the list to get the game when it's officially released. The debut of Spartacus: A Game of Blood and Treachery was a HUGE success at Gen Con 2012! Gale Force Nine sold out of the run of preview copies! Our hardworking volunteers have earned the favor of Rome for their tireless efforts during the show; running demo games and playing full games in the Gaming Hall. Early reviews of the game are already beginning to appear online and Spartacus is a hit; with one reviewer calling it the “hidden gem of Gen Con”! Now our cunning lanistas have their sights set on SPIEL ’12 in Essen, Germany in October. Are you ready to step onto the sacred sands of the arena? 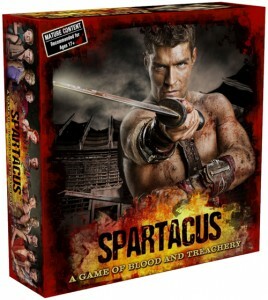 Spartacus: A Game of Blood and Treachery will be in stores late September / early October. Demand the game at your local game store so you don’t miss out on the intrigue, bloodshed and triumph! We are also taking pre-orders at the Gale Force Nine Online Store!